Saudi Arabia’s spokesman for the Gulf Arab coalition fighting against Houthi rebels in Yemen had to defend the bombing of a school bus full of children. Saudi Arabia called massive attention to its human rights practices this month when it attacked Canada’s human rights record after being challenged to release jailed women’s rights activists. Retaliating against Canada, Saudi Arabia canceled all flights to the country and suspended Saudi access to medical treatments there, potentially hurting its own citizens and keeping Canadian Muslims from visiting Mecca for the Hajj pilgrimage later this month. Saudi Arabia also crucified a man on Wednesday in a rare form of punishment that served as another blow to its global image. Saudi Arabia’s spokesman for the Gulf Arab coalition fighting against Houthi rebels in Yemen on Thursday defended the bombing of a school bus full of children, in the latest episode that has prompted renewed scrutiny over the kingdom’s human-rights practices. An airstrike from the Saudi-led coalition hit dozens, including children on a school bus on Thursday, according to local officials and medical providers. Saudi Arabia has long faced criticism over its role in the Yemen conflict, which has gone on for three years and taken an extreme toll on civilians. The conflict, driven by Saudi’s rival, Iran-backed Houthi rebels who overthrew the internationally recognised government in Yemen’s most popular cities, has killed more than 10,000. The fighting has led the Saudi-led coalition to blockade Yemen’s ports for fear of Iranian weapons getting in, causing mass starvation, malnutrition, and one of the worst cholera outbreaks of the century in the Arab world’s poorest country. The air strike “conformed to international and humanitarian laws,” Saudi spokesman Col Turki al-Malki said in a statement. He added that the strike responded to persistent missile attacks on Saudi cities and said Houthis hide among civilian populations to use them as human shields, a tactic also employed by ISIS and other terror groups. Thursday’s airstrike left “scores killed, even more injured, most under the age of 10,” a Red Cross official told Reuters, and comes at a bad time for Saudi Arabia’s image globally. 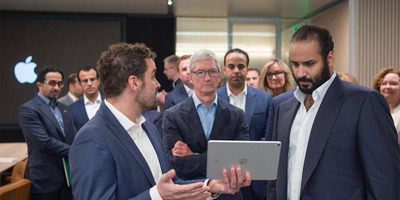 Saudi EmbassySaudi Crown Prince Mohammed Bin Salman (right) meets Apple CEO Tim Cook. On Friday, Canada’s foreign ministry asked for the “immediate release” of women’s rights activists imprisoned in the country. The call triggered an intense backlash from Saudi Arabia that saw trade, medical, and student exchanges swiftly halted between the two countries. Saudi state-owned media then took Canada to task for its own alleged human rights abuses that included the jailing of a Holocaust denier and other arrests. Saudi media’s treatment of the situation gained wide attention in the West, where the spotlight was then thrust back on the kingdom. On Wednesday, Saudi Arabia beheaded and crucified a Myanmar man accused of a litany of high crimes. The rare form of punishment received wide media attention, in part for its juxtaposition with Saudi’s recent defence of its human rights record. Saudi Arabia is ruled by its interpretation of Islamic law, requiring women to dress in conformity with Islamic code and considering them in the care of male guardians. Saudi Crown Prince Mohammed Bin Salman has led an effort to modernise the country and improve human rights, but it remains largely a theocratic monarchy. But of all the charges against Saudi Arabia’s domestic human rights record, its participation in the fighting in Yemen has drawn perhaps the sharpest rebuke. Iran, another Middle Eastern theocracy with a similarly poor human rights record, has long drawn rebuke from the US and its allies for some of the same practices in place in the kingdom. Saudi Arabia is a key US ally in the Middle East and a large buyer of US military equipment. When Saudi warplanes, or those of its Gulf Arab allies, fly missions to Yemen, they drop US-made bombs and refuel from US-made tankers. Saudi Arabia’s position as a massive oil exporter willing to work with the West has long shielded it from human rights criticism.